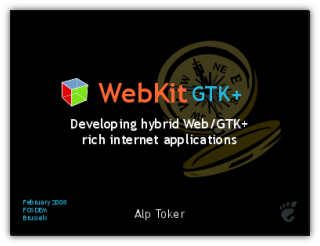 I’ve put up the slides from my FOSDEM ’08 talk on developing Web/GTK+ rich internet applications with WebKit and deploying them on the desktop and on mobile devices. If you were simply too hung over from the night before to get to the morning session or couldn’t make FOSDEM, be sure to check it out. Really? With all the shininess in the images? Or are you generating those outside impress and importing them in? Awesome slides (both content and presentation). I wondered at one time whether you were using Apple’s Keynote for slides. It’s encouraging to see that OO.o is capable of this. I’ve been using WebKit in my GTK app the last week, porting away from Gecko moz embed. It is just stunning in every way. Excellent API, fast engine, great graphics features and compatibility. Keep doing what you’re doing and the world is yours for the taking. This talk really excites me. Great presentation, so bad I couldn’t attend! I join the crowd asking if you generated the shiny images inside or outside Impress. Nice slides!. On useful topics, let’s see if I can get back to producing patches… hope this time they are not half-broken :P.
Any news on when/where we can download a build for maemo? Diego: The images really are done in oo.o 🙂 It’s just a matter of flipping and playing with the alpha. Christian: Sure, I can do (1) and (2) though we don’t yet distribute binaries. It’s up to developers to build their own and see for themselves really, this is just a community project without lots of bandwidth and distribution channels for every platform and architecture. Alp, I wasn’t really asking for you to distribute binaries as such, just a link to the binary you have been using for the tests. Looking forward to seeing the details of the SunSpider test. Will you put a link on your blog to them? Very interesting! I just spent a few days working on a hybrid PyGTK/gtkmozembed maemo application, and having a lighter engine with a more powerful API would definitely make a lot of sense. I see that this is also posted in maemo category – can you give me some hints or links about where to get or how to build webkit for maemo? Also, are there any plans for python bindings yet? The way to stylize Pidgin was incredible. IDEs like monodevelop or Anjuta already provide a “start page” like a web document (not really one), will be amazing when html5 to arrive with newer ways to diagrammatize and stylize information in apps. Oh, utilizing po files (or even data from cloud too)! And this it’s only a dot; host desktop widgets and e-paper are good concepts for this new future too.